The Sports Physical Therapy Section (SPTS) created the North American Journal of Sports Physical Therapy to address current physical therapy trends and practices to improve the care of the recreationally active individual. It was designed as a benefit of membership for the Sports Physical Therapy Section of the American Physical Therapy Association. The first issue was released February 1, 2006. Beginning V4N1, the Journal became an online publication and all archives were posted on the NAJSPT website. Members and subscribers have immediate access to the publication and articles are available for purchase by non-members. Subscriptions are also available for non-members. 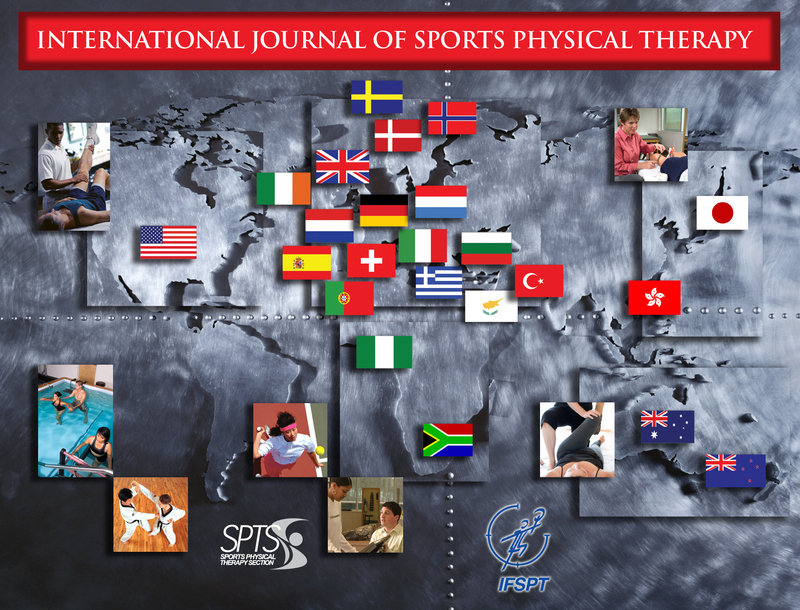 On January 1, 2011, the journal became the International Journal of Sports Physical Therapy, and serves as a benefit of membership for countries around the world. It is an official publication of the International Federation of Sports Physical Therapy (IFSPT). The journal is currently indexed by PubMed, CINAHL and Sport Discus. If you are a member of any IFSPT member organization, you are eligible for significantly reduced subscriptions to the IJSPT! Contact your member organization headquarters to find out which participation option your group has selected. Option 1: Your subscription is part of your membership dues. Option 2: Your subscription may be paid through your organization. Your headquarters or Journal Liaison can provide you with information on how to register. Option 3: Your subscription must be paid directly to the IJSPT. IMPORTANT: Select "IFSPT Member" Option. Click here to subscribe. Three subscription options are available to IFSPT member organizations for participation in the IJSPT project. Please take an active role in supporting our partnership with the Sports Physical Therapy Section and the Editorial Board of the International Journal of Sports Physical Therapy. The IFSP Member Organization financially underwrites the cost of IJSPT subscriptions for its entire membership or is willing to include the cost of the IJSPT subscription as a mandatory part of their annual dues structure. The Member Organization will establish a link from their website (if available) to the IJSPT website. Upon receipt of payment and the membership file, IJSPT will assign each member a unique log-in and password. IJSPT will provide the member organization with an electronic file containing this information. The member organization will be responsible for forwarding the log-in, password and complete instructions on how to access “IJSPT on-line” to each of their members. Members will have the option of accessing the Journal through their Member Organization website link or directly through the IJSPT website. The Member Organization will provide complimentary advertising for the IJSPT in their print and on-line publications. The Member Organization will collect subscription fees as part of their annual dues process, with subscribing to IJSPT as an optional transaction. The Member Organization will be responsible for forwarding this revenue to IJSPT along with an electronic file of their membership database including email addresses for subscribing members. The process may be modified as needed to accommodate privacy regulations in individual countries. Your Journal Liaison can assist with this process. Upon receipt of payment and the membership file, IJSPT will assign each member with a unique log-in and password. IJSPT will provide the member organization with an electronic file containing this information. The member organization will be responsible for forwarding the log-in, password and complete instructions on how to access “IJSPT on-line” to each of their members. Subscribing members will have the option of accessing the Journal through their Member Organization website link or directly through the IJSPT website. The Member Organization will promote IJSPT to its membership through print and on-line publications. Subscriptions will be processed directly between the individual member and IJSPT through the Journal website. Support our journal and our organization! Once your organization has chosen which option it will offer to your members, contact your Journal Liaison, or Mark De Carlo. Even if you are not a member of SPTS or the IFSPT, you can still stay up to date with the latest evidence-based research with a subscription to the International Journal of Sports Physical Therapy!